Our babies were born on December 14th, about eight weeks before their due date, and four weeks before my scheduled C-section. The past two weeks have been an incredible blur, but I wanted to make sure to write out everything that happened leading up to (and during) the delivery, before I forget more detail. On Thursday the 13th, Chuck called me on his way home from work. About a week prior, my doctors had asked me to start checking my blood pressure at home, even though my numbers had never been elevated. As I’ve mentioned a bunch of times, my pregnancy had been surprisingly smooth, especially considering I was carrying triplets. I hardly had morning sickness, and my back had just begun to really ache. I had been diagnosed with gestational diabetes, but was watching my diet pretty closely, so I never needed insulin. I had checked my blood pressure a couple times with an old cuff that Chuck had at home, but wasn’t really concerned about doing it regularly. The cuff was also unreliable—the numbers tended to read high. But when Chuck called, he asked me to check right then. Actually, he was adamant that I check, which was unusual for him. So I did, and as I was expecting, my numbers were high. We decided that I should call the hospital. I responded to most of this by rolling my eyes…I had been healthy for months and didn’t expect anything to change, especially so suddenly. My doctors’ office was closed for the day, but I left a message with the hospital. They called me back within ten minutes. I explained that I checked my blood pressure at home and my numbers were elevated, but seriously, my husband’s cuff was really old and who knows if it’s even close to my actual reading. The PA told me that it’s important I come to the hospital, that I should pack a bag, and asked how soon I could be there. At this point, I was slightly aggravated, as I was sure I would end up apologizing for using a shoddy cuff and wasting everyone’s time. Chuck and I got to triage and waited for about a half hour before they brought us back and went through all the standard tests. Soon after, a doctor came and sat on the edge of my bed. From that moment, everything sort of went crazy. She held my hand. You have severe preeclampsia. My experience with preeclampsia was limited to Season 3 of Downton Abbey. I pictured Lady Sybil fading out of consciousness while giving birth. I was terrified, but mostly I was shocked. I knew my chances for developing preeclampsia were higher with triplets, but since everything had gone so well so far, I figured I was clear. I never anticipated developing something "serious" or "dangerous" (words that my doctors associated with preeclampsia) when I was being so closely monitored. I didn’t process much else of what she said. Luckily, Chuck asked, “So just to be clear, these babies are going to be born within 48 hours?” which put everything into perspective. I cried. I was scared for the babies. I wasn’t ready…I thought I’d still have at least a couple weeks to wrap my head around actually giving birth. Chuck held me. Before I knew it, I was surrounded by nurses. The next 24 hours were...hard. They were probably the hardest of my life. I was given a shot of betamethasone (steroids) to help develop the babies’ lungs. The full course would’ve included a second shot after 24 hours, but I didn’t make it that long. I had IV's put in both hands (it took a several attempts, which I only mention because I hate IV’s) and given a drip of magnesium sulfate to prevent seizures. Finally (and most miserably), my nurses strapped three belts around my stomach connected to fetal dopplers to monitor the babies’ heart rates. In order to accomplish this, they had me lay on my back (which is already the height of pregnant discomfort) and gave me an ultrasound in an attempt to pinpoint the location of each baby. I would need to hold this position forever (until I gave birth). That was the longest night of my life. I remember staring at the clock on the wall in front of me, watching the seconds tick by, trying to encourage myself to be strong. Whenever I would adjust my hips, or try to turn slightly, or really make any movement, the belts would shift and the doppler would lose track of one or more of the babies’ heart rates, and the nurses would come in and try to find them again. Half the time they would have trouble and need to do the ultrasound all over. My entire body was locked up from hours of trying not to move. I could hardly breathe from spending all that time on my back. I was soaked in ultrasound goop. My throat was so dry it felt like the sides were sticking together, and I wasn’t allowed even a sip of water. And to make matters worse, I’d been fighting a cold on and off for the previous month and my entire face was congested. This continued until the next morning. I was so utterly miserable that I couldn’t even communicate to Chuck how I was feeling. I was hyper-focused on the belts across my stomach and wondered if I was capable, physically, of lying there for another 24 hours. I didn’t sleep, but at some point that morning, I hazily opened my eyes and was surrounded by the doctors from my practice. I was, honestly, kind of awe-struck. This was the group I had been handed over to by my regular OB-GYN because her office “didn’t do triplets.” I’d only really saw pictures of them, having had my appointments with nurses and PA’s, but here they were, the high-risk pregnancy experts discussing my situation. The belts must have shifted because they brought in the ultrasound. The doctors tried (again) to find each baby. I’m not sure how much time passed with all of them in the room, and can’t remember most of what they talked about, but eventually, one of them turned to me and explained that they weren’t able to distinguish, with certainty, each of the heart rates, and therefore, they would be delivering the boys. Like, right now. Everyone flew into action. I was terrified, but relieved. The nurses came back into the room and began to prep me for surgery. Before I knew it, I was being wheeled down the hallway. There were about 25 people in the operating room. Aside from my doctors, nurses, and anesthesiologists, each baby had their own team. They hung a blue curtain to block my view of my torso, and Chuck was brought to my side wearing scrubs and a mask. I was given a spinal block to numb the lower half of my body (I don’t remember even feeling the shot). Once it took effect, the only sensation I had was my stomach rocking back and forth on the table. I asked the closest doctor if they were starting. She laughed and said they were way past starting. I have a clear picture of that doctor’s eyes. She was constantly reassuring me. I turned to look back and forth between her and Chuck over and over, and kept hoping it was almost done. Finally, a voice said, “first baby out!” There were some brief, and soft, sounds of celebration, and I heard a tiny whimper. Each baby was immediately placed in an incubator and sent to the NICU. They stopped briefly beside me on their way out, but I could barely see inside. I wouldn’t get to visit them again for hours, which was probably the most torturous part of the whole experience. As I was being wheeled out of surgery, I noticed a bright red splash of blood across the ceiling and pointed it out to Chuck. “Yeah I wasn’t going to mention that,” he told me. My recovery was pretty uneventful. I trembled and shook for a while after, which I was told was normal. I was finally allowed to have a drink, and although the nurse told me to take it slow, I guzzled ice water and apple juice. They were the best drinks I ever had in my life. I was seriously overjoyed to be drinking anything. Our families came to the hospital and, agonizingly, were able to see the babies while I remained confined to my bed. When I was finally helped to a wheelchair and brought to the NICU, I saw that the boys were covered in a jumble of tubes and wires. It would be 2 days before I could hold one of them. After 4 days of happily residing in the hospital, close to my babies, I was discharged and sent home. Ben, Noah, and Charlie are now just over 3 weeks old. 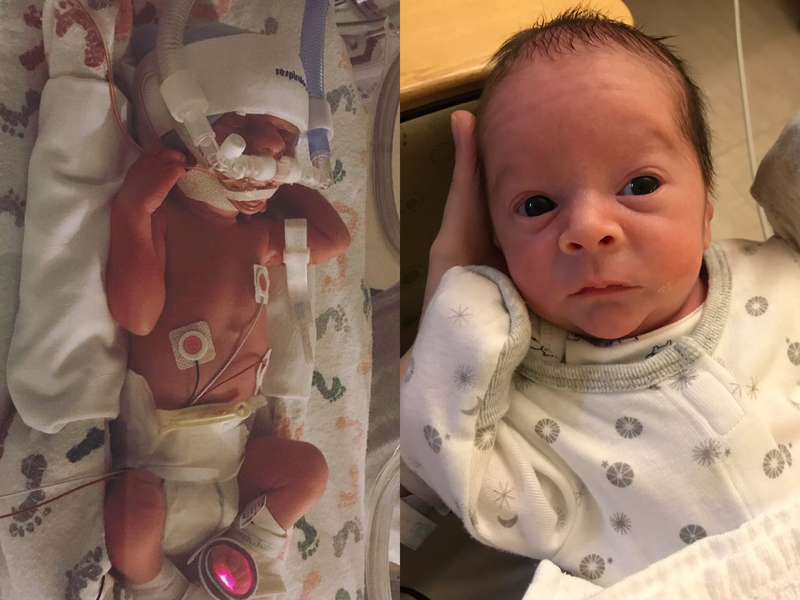 The NICU doctors and nurses have been incredible, but it’s hard. I thought the constant back-and-forth to the hospital would get easier, but every day is worse. I tend to be in a constant state of either crying or getting ready to cry. I tear up when I leave my dogs in the morning, I tear up when I’m getting ready to leave the hospital, I tear up when I get home and the house is a mess. It’s ridiculous. The days are moving quickly, but it feels like forever until they’ll be able to come home. And when I’m home, I’m pumping. And it’s miserable. I’ve always loved and guarded sleep, but I’m so worried about producing enough milk for everyone that I’m (probably overzealously) waking myself up throughout the night to stay on schedule. Of course, there will come a point when I won’t physically be able to make enough milk for 3 infants, although I still won’t be sleeping, because I’ll have 3 infants at home. Even though I constantly feel tired and weepy and gross, I’m so happy. Our boys are making progress every day. They’re gaining weight, drinking bottles, and showing us pieces of their little personalities. I’m looking forward, every day, to having them home with us. As wild as the past 4 weeks have been, they’ve made everything worth it. Here we are less than 6 weeks away from delivery! I’m fortunate that I’m already home from work on maternity leave — the extra weight is getting crazy uncomfortable. At this point, I’m starting to organize the house for the babies. We still have cribs to build, onesies to sort, and pictures to hang, but everything is coming along. We’ve made a lot of changes at home over the past couple months! We carpeted most of the second floor, including the stairs, and finished painting the rooms that we skipped when we moved in. Chuck, with his brother and dad, installed new flooring in the nursery and downstairs, and I am in love with it. We still have some touch-ups before everything is finished, but it’s been a lot of progress in a short time. The boys are still doing great. As of last week, two weigh 3 pounds, and the third is 2 pounds, 6 oz. I was diagnosed with gestational diabetes about 3 weeks ago, and while I’m not a fan of the finger-pricking hassle, overall it’s been pretty uneventful. It’s getting harder to capture good pictures from the ultrasounds since they’re so squished, but here are all 3 last week. I was amazed when our tech pointed out tufts of hair on the back of Baby C’s head. It’s still very surreal that there are 3 in there. I’ve gained 48 pounds and expect to gain a bit more, although the majority of my maternity clothes are already way past fitting. Most of my shirts, along with any “full panel” jeans, won’t stretch over my stomach. Most of what I’m wearing comes from Chuck’s closet, which is much more cozy anyway. I’m seeing my doctor weekly and will be starting non-stress-tests twice a week. It’ll be a lot of time spent at the hospital, but I’m sure the weeks are going to fly as they have been. I am a little nervous about being prepared for the hospital. How much clothing should I pack? And what kind? Will they need preemie sizes, or just newborn? Should I bring a ton of socks, or just, like, 3 pairs? So hard to know! I’m still pretty exhausted, but aside from an obnoxious cold that I’m finally starting to conquer, I feel really lucky with how smoothly this pregnancy has gone. The skin on my stomach is starting to get so itchy and painful, and my hands and feet are so, so swollen. My fingers on my right hand are almost always numb, which is the worst. And although I feel like I’ve held it together emotionally for the last seven months, lately I feel kind of miserable for no reason. Fortunately, whenever I’m resting at home, the kicking and movements are so comforting that they wash away a lot of the discomfort and frustration. We’ve received so many gifts and hand-me-downs from our friends, family, colleagues, and church, and are so grateful. It feels like the boys are already being welcomed into a caring and loving community. I’m also really proud of our pups and how they’ve handled the changes so far. They’ve been so sweet and behaved with visitors, especially kids, which makes me confident that they’ll adapt a bit more easily to our crazy new reality come January. As far as stitching, most of my focus has been on Heritage (Plum Street Samplers). I keep it next to the couch and grab it now and then when my hands aren’t hurting (I haven’t been able to wear my wedding rings in months!) and I can find a comfortable position for more than 5 minutes. Surprisingly, I have made a little progress! 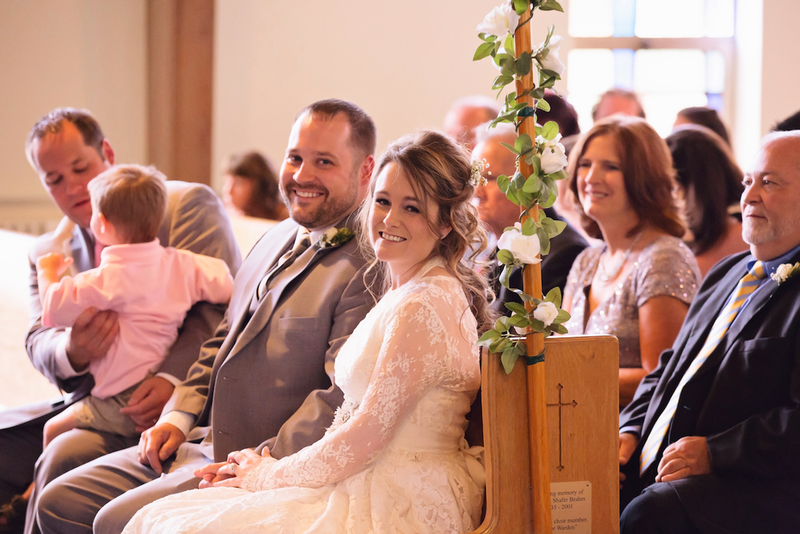 It’s hard to believe our wedding was almost 3 months ago. It was a beautiful day—simple and happy. Since our engagement was relatively short (only about 6 months between the proposal and wedding), we had a lot of planning to do in a brief amount of time. Luckily we both had the same idea about what we wanted: a fun and stress-free party with our friends and family. Our budget was tight, but the day turned out exactly as I’d hoped. Of course there were moments of stress. We had to find available (and affordable!) vendors in a shorter amount of time. 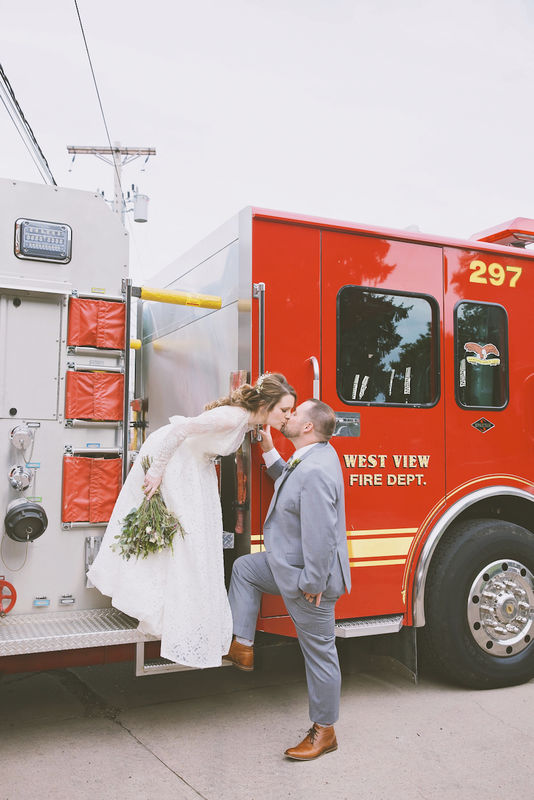 We received a lot of help pulling everything together from our family (and friends), and fortunately, the two biggest decisions were already taken care of—we already attend a church that we love, and with Chuck being a fireman, the obvious choice for the reception was his fire hall. I am not usually a crier, but surprisingly, from the moment the doors opened at the back of the church and I saw Chuck at the end of the aisle, I became a blubbering mess. To keep with the “low-maintenance” theme, we had a small wedding party, consisting entirely of my sister (Molly) and Chuck’s brother. I basically gave Molly free reign when choosing a dress, and even though the color changed three or four times before she decided, I loved what she eventually picked. I used her dress color as the main accent for the rest of the wedding. I got ready at our house in the morning. Chuck prepped at his Dad’s house, nearby, stopping at home once to bring me flowers and Trader Joe’s chocolate coconut almonds. One of my mom’s coworkers came over and and did my hair. Since I wasn’t wearing a veil, I knew I wanted to wear flowers, and she listened and pinned until everything was perfect. It really was wonderful being able to get ready and relax at home (with my family and dogs! ), listening to my favorite music in the kitchen and eating Middle Eastern food and donuts. We took an uber to the church. I think it was a blue minivan. My dress…wasn’t exactly smooth sailing. In the short amount of time between buying the dress and the day of the wedding, I had a gained a good bit of weight. The first round of alterations included, among other things, taking out the back as far as it would go (and hoping for the best). By the time the next fitting rolled around, the zipper again wouldn’t budge. By that point, the only option was ripping out the whole thing and putting in a corset-back. This wasn’t my ideal, but it had to work. At that point, I also decided that the halter-style of the dress was too revealing. I found a lace top to wear over it that wasn’t exactly the right shade of ivory, but got the job done. Overall, the ceremony really was perfect. 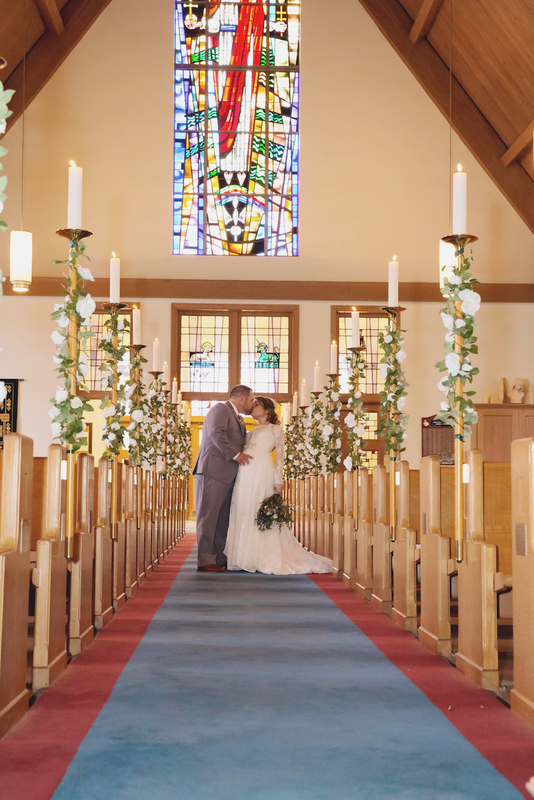 We took our pictures at the church (inside and out), and after, Chuck drove the four of us to a local park where we could breathe for a few minutes and get some pictures of our small wedding party. It was supposed to be a rainy day, but luckily stayed dry for as long as we were outside. We also made a quick stop at the fire station for a couple more pictures. These are only a few of my favorites of the hundreds of pictures we received. I haven’t even started sorting through reception shots yet, but suffice it to say, it was a great celebration. Our cake was a tiny two-tier comprised of burnt almond torte on the bottom (for Chuck) and chocolate on the top (for me). We had a buffet that received rave reviews (the food was seriously amazing), and aside from a couple small snags (we didn’t have a knife available when it came time to cut the cake, and the cake-cutting song, Cake by the Ocean, had almost finished by the time one was wrangled), it was a blast. I also, finally, made an addition to the tapestree! So much has happened in the last three months that I still feel so behind, but I was able to stitch something simple to commemorate our wedding day. 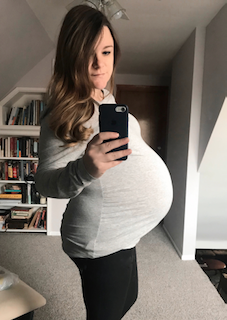 Quick baby update: Over the past week, I’ve started to feel some very pronounced kicking, and it’s getting stronger every day. Chuck was able to feel the first kicks on Monday of this week. Strangely enough, the three of them take turns, so while I can feel their individual kicks and pushes in different areas of my stomach, it’s never at the same time. It’s like they’re awake in shifts. In addition to the kicking, I’ve also begun to experience the joy of crazy back pain. It came out of nowhere, but it’s been intense. I’m still growing rapidly, of course, but hopefully a few more weeks will help me learn how to carry myself, and the sudden aches won’t be quite so shocking. We found out late last week that our three babies are three boys! It was the last thing I was expecting. I had assumed there would be a mix, and if not, they would all be girls. Needless to say, we’re overjoyed. Now I’m able to refer to the group as “the boys.” And they definitely feel like active little boys, especially at 4 AM. There haven't been many true “kicks” quite yet, at least that Chuck would be able to feel, but I love that I can tell when they’re rolling and fluttering around. The 20-week ultrasound was surprisingly in-depth. It took the technician close to 4 hours to get all of the measurements she needed (and even then, they were still too active to get everything we wanted, but are growing and healthy overall). She measured everything—nasal bones, waist sizes, hearts, heads, everything! Strangely enough, I was most affected by their legs and feet. Everything looks so clear and perfectly formed, it’s amazing. The genders were revealed in the middle of gathering measurements for each baby, rather than right in a row, so there was anticipation for each one. But by the time we got through Baby B, I had a strong feeling that we were dealing with 3 boys. There was a lot of laughter. I’m still pretty tired and unmotivated. My maternity clothes are starting to get a little tighter (I’ve gained close to 25 pounds, and my doctor advised that I aim for 50). I continue to be nervous about what I’m going to put on my body by the time Thanksgiving rolls around. I might be investing in muumuus. Overall though, I’m really enjoying this phase of my pregnancy. The weather has been my idea of perfect (cool and frequently rainy with the occasional bursts of sunshine). We’re starting to make plans for some projects at home, including the nursery, and I’ve had several days where I’ve felt such intense grace and gratitude and love for my husband, home, and our little family. And (!) my hair has finally stopped falling out (you would think that all that testosterone would cause a spike in hair growth, instead of the other way around)! I wish I made more time for stitching, but am still having a hard time doing anything once I get home from work (besides eat!). I’ve made a tiny bit of progress on a couple projects, but nothing substantial. 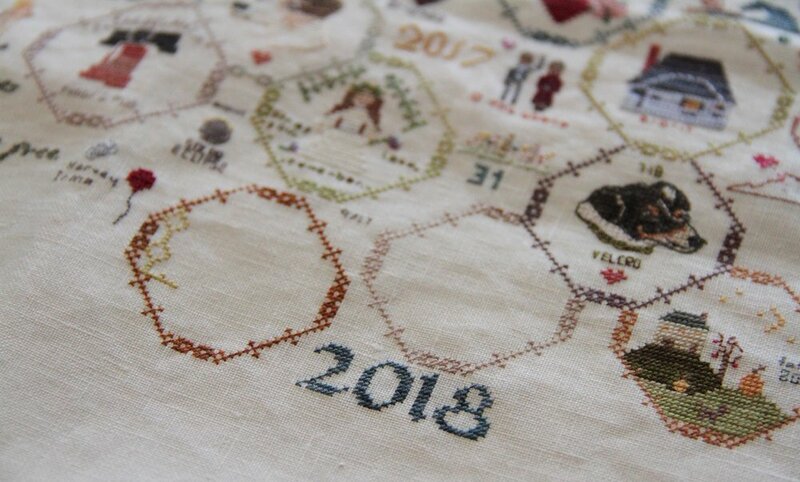 Anniversaries of the Heart by Blackbird Designs — This is my second time stitching this series (I made it about halfway through last time), and it’s been a couple years since I started it up again. I’m having so much trouble getting beyond Block 2! Jack’s Bash by Plum Street Samplers — I love the sawtooth border and the colors on this one. 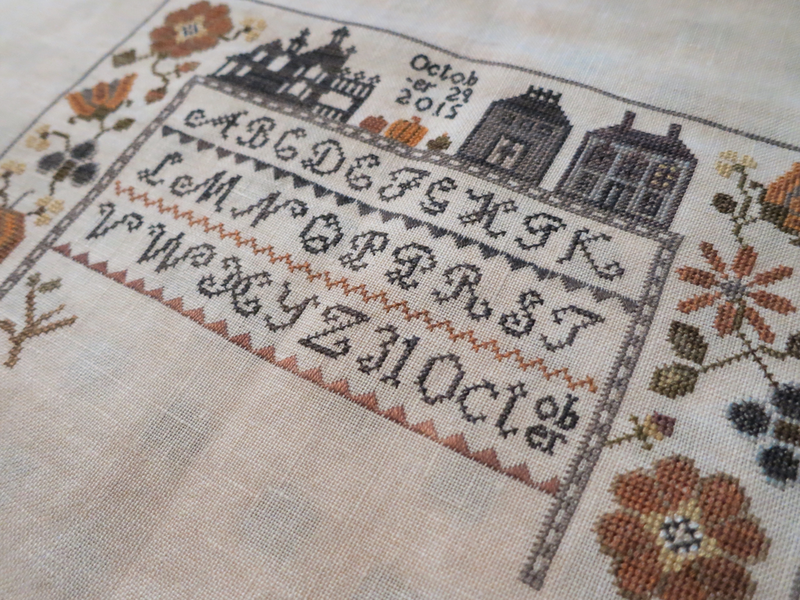 Heritage Sampler by Plum Street Samplers — I’m just now realizing how many of my WIPS are by PSS. I love the colors in this border too! I’m hoping to finally make an addition to the tapestree over the upcoming three-day weekend. I’m still obsessing over the ‘For the Birds’ series by Blackbird Designs, but it looks like it will be a while before I’m able to splurge for new patterns. Luckily, I can live vicariously through the tons of stitchers on Instagram. I’m so grateful for this community! I’m 19 weeks pregnant with triplets, I can still hardly believe it. I’ve definitely felt very pregnant over the last week or two. My first trimester wasn’t bad, all things considered. Although I had a few days of nauseousness, I rarely got sick. My biggest ongoing symptom so far has been total exhaustion. It’s tough not having the energy to write, stitch, quilt, etc. once I get home from my job. I always spend my mornings looking forward to everything I’m going to accomplish after working all day, but by the time dinner is over and the dogs are cuddled, I am completely wiped out. Before I was pregnant, for years, I made mental notes of everything I wanted to do to prepare for a baby, and I am so not on track. I’m still waiting on the mysterious second trimester energy boost. Luckily I’ve almost finished one baby quilt. Hopefully it won’t take another six months for the next two! I’ve also noticed, especially over the last few days, that I’m not moving as quickly. My legs and feet get tired after walking laughably short distances, and everything feels hugely uncomfortable. Of course, my stomach is continuing to grow bigger by the day. I’ve reached the point where I can only wear the few pieces of maternity clothes I have, even though the majority of my wardrobe was oversized to begin with (I’ve never liked tight or form-fitting tops). I can’t imagine what I’ll be squeezing into in another month. Also, people tend to move out of my way when they see me coming, which always makes me laugh. Aside from the physical changes, I’m starting to have more frequent spells of anxiety over all of the fears and unanswered questions. Will the house be ready in time? Can we fit three cribs in the nursery? How will I manage to feed three babies? How are we going to afford anything? I’m so fortunate for Chuck. He’s so patient and reassuring when I feel like I’m losing it. I hope I don’t sound completely negative! I’m still so grateful and excited. There are times when I have sudden moments of clarity and think wow, this is happening. It helps that I’ve been feeling a lot of movement…it seems like kicks are right around the corner. We were able to hear all three heartbeats at my last appointment at 17 weeks. It’s still so surreal to see all of them on an ultrasound. We’re less than two weeks away from learning genders (September 27th)! One more fun thing happened recently. One of my patterns was published in Just CrossStitch Magazine’s 2018 Christmas Ornaments edition! There are so many beautiful pieces this year. If only I could cross stitch full time. I hope I’m able, over the next few weeks, to reflect more on the little details and moments of everything that’s happening (and the changing seasons, because I love, love fall). 2018 is turning out to be a year of milestones! 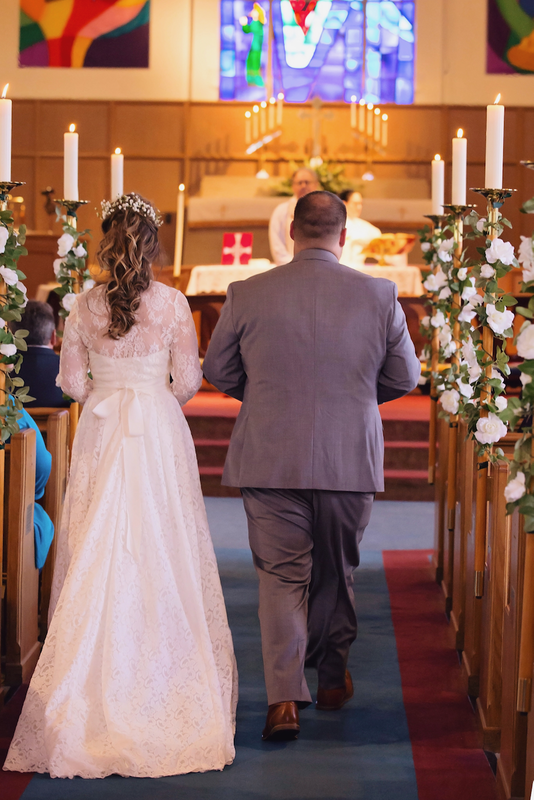 Our wedding was beautiful and so much fun (I shared a couple early pictures in my daybook, and am looking forward to receiving the collection from our photographer so I can detail the whole day). 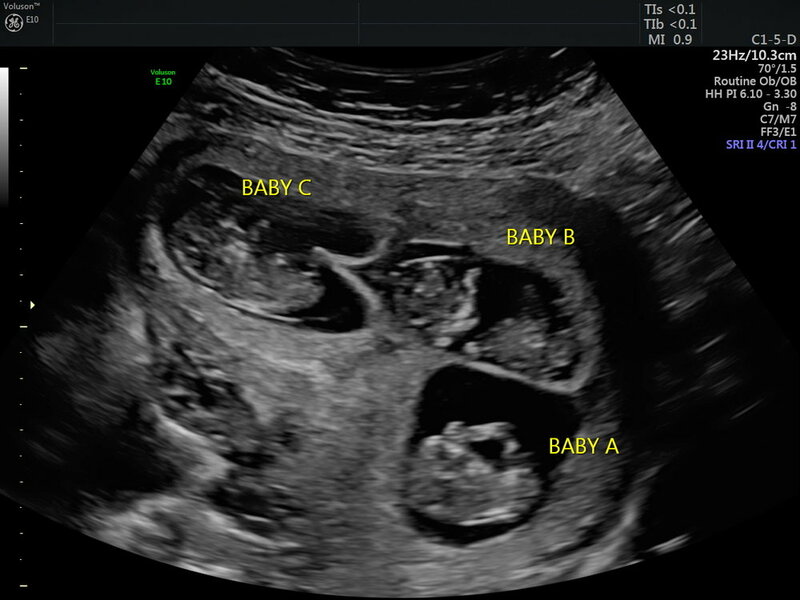 In crazier news, we found out several weeks ago that we're pregnant...with TRIPLETS! And now that the news is out, I can't wait to begin sharing the progress over the next few months. I'm currently 15 weeks. We found out the big news around week 7, and I've since had 3 ultrasounds. Of course, since this is my first pregnancy, I'm learning everything as I go. When I had the first ultrasound, knowing only at the time that I was pregnant, I was most surprised by how long it lasted. My technician was not allowed to disclose any info, but looking back, it's clear that something was...different. When Chuck and I finally met with my doctor, I was more than a little nervous. Immediately after we sat down, she slid the print-outs across her desk and announced, "well, there are three in there!" I can't exactly remember how I felt. Shocked, definitely, but also a little batty. I remember thinking this is hilarious. Surprisingly, laughter has been the most common response from our friends and family, once their jaws have finished dropping. For me, it took a few weeks for the reality to set in. I had some morning sickness, but for the most part, aside from being profoundly tired once I got home from work (which wasn't totally out of the ordinary), I felt relatively normal. I learned at my next appointment that my regular OB wasn't equipped to handle multiples (aside from twins), and my care was therefore transferred to our hospital's Maternal Fetal Medicine division, which has been a good but eye-opening experience so far. 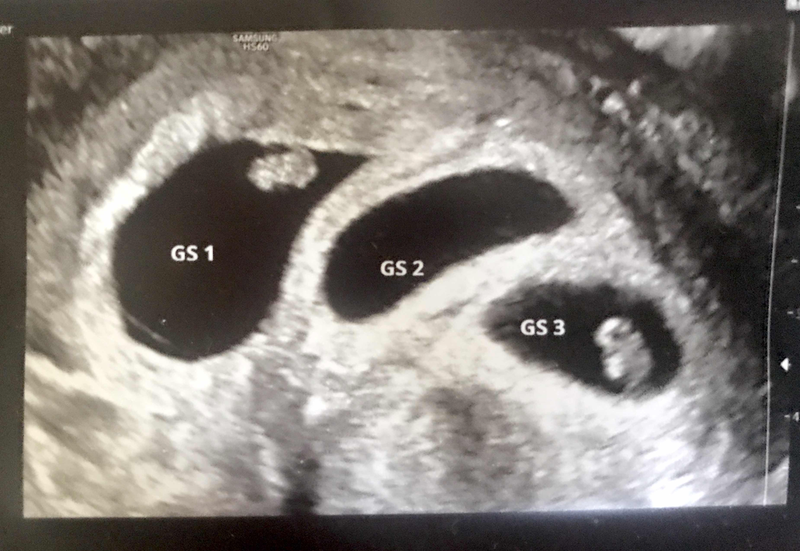 The new team of doctors spent a lot of time covering all the risks associated with triplets, without a speck of sugar-coating, and my anxiety was kicked up for a long time after. At our 10-week ultrasound, I was so shocked to see 3 baby-shaped figures, wiggling and flipping all around, despite barely feeling a thing. Since then, the main feature of my pregnancy has been my ever-increasing size. By the time I was out of my first trimester, I had an obvious baby bump that continues to grow by the day. 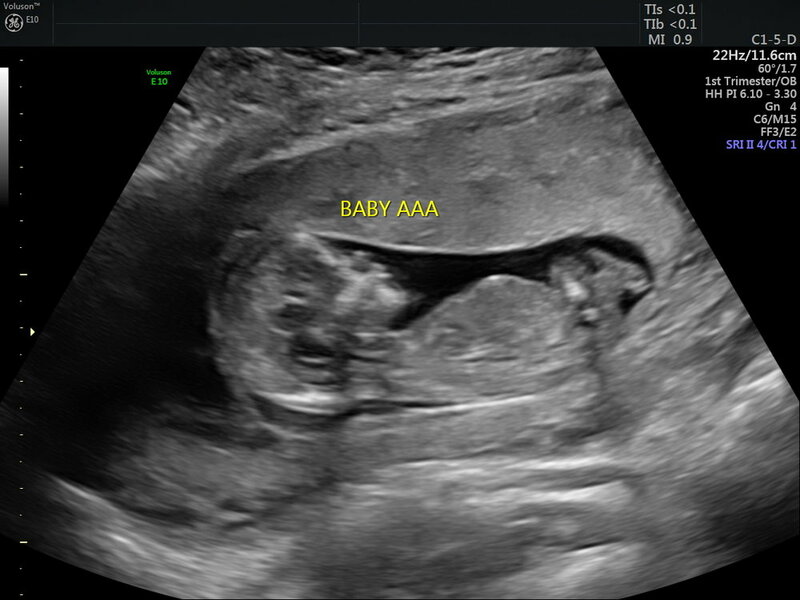 Our most-recent 13 week ultrasound confirmed how quickly Baby A, Baby B, and Baby C are growing. It took a long time to get good pictures and correct measurements for all three. We took two breaks and even switched technicians when the first couldn't capture the images she wanted. Baby B, the one in the middle position, was so squirmy and wild that we never did end up with a clear picture. Fortunately, we left with the knowledge that all babies were growing and healthy. We're 5 weeks away from learning the genders. We're absolutely finding out, as long as Baby B cooperates! My symptoms have been surprisingly more noticeable during this second trimester. Aside from a growing belly, I've been even more tired, and struggling with headaches. I was expecting some crazy cravings, but so far, there hasn't been anything odd. It's one of the biggest questions I've heard from friends and family (and strangers!) since finding out I was pregnant: "What are you craving?" Unfortunately, it's nothing exciting! I've mostly been (very) hungry for the things I've always loved--potatoes, dairy, and Chipotle. I also dearly miss coffee and beer. Overall, we're both so thrilled. We know that our world is going to be turned upside down very shortly, but for now, I'm enjoying my pregnancy and looking forward to every milestone. I started this design in October last year, when I was frenzied with excitement over the shift to cool weather and the horror movie marathons playing daily on cable. I've always found a comfort in scary stories. When I was little and lived with my grandfather, I wanted to do everything he did, including watch the movies he watched, and though I didn't realize it at the time, he was watching a lot of horror. Rosemary's Baby, The Omen, and The Birds were part of my subconscious before I realized they were meant to be scary. As I got older, I searched the library for musty ghost anthologies and dared myself to read Scary Stories to Tell in the Dark when no one was home. I somehow missed The Yellow Wallpaper by Charlotte Perkins Gilman until a few years ago. If you've never read it, it's very short and easily found online. It's still the creepiest thing I've ever read. There's an even shorter summary on the Wikipedia page, though I would definitely recommend the full read. It not only paints a vivid picture of how women's health was viewed in the late 19th century (i.e. "hysteria"), but the imagery, especially at the end, is surprisingly terrifying. It's kind of fitting that I started this design in October and only finished it up this week, since it was my own restlessness that prevented me from making any progress until now. Looking back on the five years (!) I've worked on my tapestree, I've noticed a trend of adding designs pretty consistently through the spring and summer, slowing down at the beginning of fall, and then disappearing completely until the weather hit above freezing again. This isn't surprising, since once the sun sets for winter in Pittsburgh and everything is gloomy for five months, I have a hard time finding the motivation to do anything. If I make one resolution this year, it will be to work on my relationship with the holidays, aka the very worst season. Someone remind me on Halloween? I also want to work on being a little less fussy with how I use this space (along with some of my other social media). I've noticed over the last several months that writers and bloggers (or at least the ones I'm drawn to) are beginning to move back toward realness. And I don't necessarily mean "I'm eating French fries again!" authentic, but actually sharing the messier aspects of their lives. It's been not-as-rare to see discussions on otherwise picture-perfect timelines that bring up depression, anxiety, loneliness, infertility...in ways that feel genuine. I think that sort of shift is exciting, and it's pushed me to look at how I'm using social media, because even though I'm still unreasonably cynical about...most things, I'm starting to realize that for as much as I obsess over nostalgia and history, I'm not utilizing the tools I have available to document the important moments of my life because I'm too concerned with some goofy aesthetic, which is actually ridiculous. I know it has a lot to do with my own weird anxieties, but looking back on the past year and seeing how little I've stopped to acknowledge, good and bad, is kind of scary when considering how quickly time passes. So, something to work on. I'm grateful that I started my tapestree for that reason—there's something about needlework that generates mindfulness. I don't generally have a good memory, but I can look at each of the designs and remember where it was stitched, what was happening in my life while I stitched it, and my feelings at the time. I remember sitting in bed in a terrible hotel room in Maryland and stitching the Poe crow, how the sunlight felt in my brand new city apartment when I added Carson Street, and how, last year, I thought we'd never find a house. It really feels like recording pieces of myself in cloth, which I love. I finally started binging on Outlander over the past week. As I slowly fell in love with Jamie, I figured that the most logical course of action, before starting Season 2, would be to find a Scottish cross stitch chart to work on while I caught up with the rest of the series. I immediately fell into another crazy obsession. It started when I began browsing the Scottish section of The Scarlet Letter. I narrowed my potential purchases down to two reproductions. 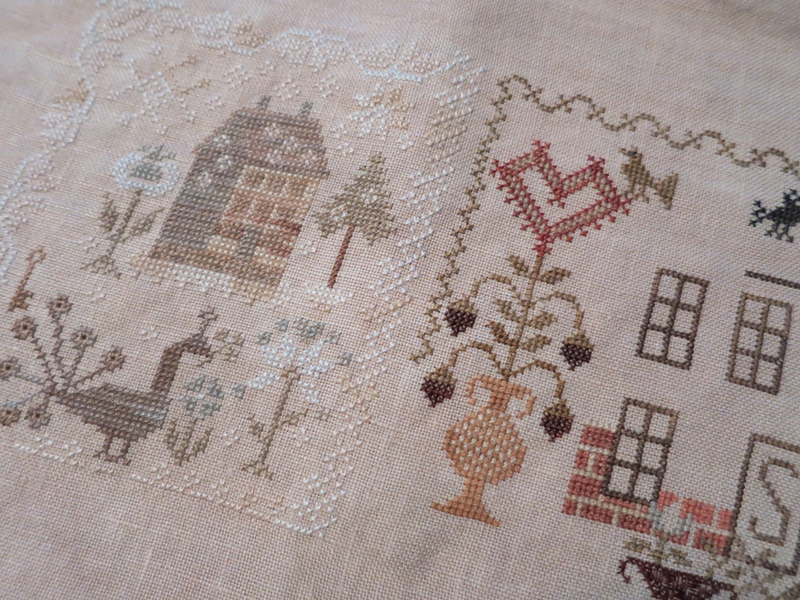 In my last post about historical cross stitch, in which I listed the reasons I’m so in love with samplers, I talked about the aspects of the stitchers' lives that were recorded in fabric—namely their education, status, families, and interests. Going deeper, I’ve been reading about how all of those qualities represented their feelings, roles, and experiences surrounding death.